A lively discussion is going on at armscontrolwonk about the new missiles seen in North Korea’s recent parade. The missile attracting the most attention is the so-called Musudan, which looks like a stretched version of the Soviet R-27/SSN-6 missile, which I wrote about earlier. A key question is what range this missile might have for various payloads, assuming it is based on SSN-6 technology. The range will determine what it could target, in principle. Some press reports have suggested a range of up to 5,000 km. I’ve done some modeling, and here is what I find. I first developed a computer model of the SSN-6 that gives a range of 3,000 km with a 650-kg payload, which is the longer range given in Pavel Podvig’s book for the SSN-6 (more on the model below). Keep in mind that for a first generation nuclear warhead, payloads at the low end of this range are unrealistic. So it doesn’t seem plausible that this missile could have a useful range much greater than 4,000 km. 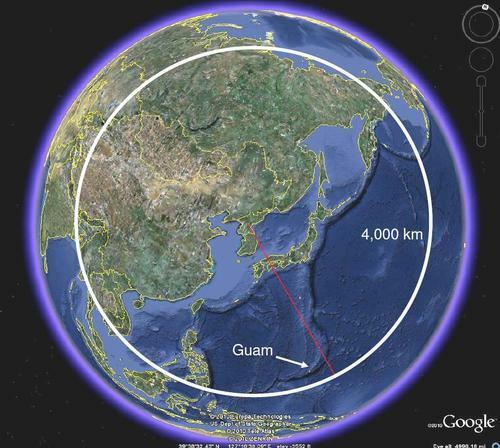 The map below shows a circle of radius 4,000 km centered on North Korea. It’s also possible that the range of the missile is well under 4,000 km. If this missile is instead based on the version of the SSN-6 with a range of 2,400, the corresponding ranges will be shorter. Moreover, the SSN-6 was a highly optimized design, with considerable effort made to minimize the mass and maximize the thrust. If the missiles seen in the parade were built in North Korea and were not of the same technical quality, that will also reduce the range. Finally, it’s worth emphasizing that no one has seen a flight test of the Musudan, so they can’t be assumed to be operational, and at this point they would seem to be more bark than bite. But if they do become operational, their range is a big step beyond the Nodong, North Korea’s longest range deployed missile, which has a range of about 1,500 km with a payload of less than one ton. The Musudan appears to be the first North Korean missiles without fins. That suggests they have a better guidance system, as was discussed in the comments here. Keep in mind, however, that the guidance system only helps during launch, and that much of a missile’s inaccuracy comes from reentry, due to buffeting and winds in the atmosphere. The shaped nosecone may help reduce errors by speeding the RV through the atmosphere, but that can only help so much. Here are my assumptions for the SSN-6 and Musudan models. I don’t claim these are highly accurate since I don’t have enough information about the missile, but these should be good enough to give reasonable range/payload estimates. The burntime for the Musudan assumes it has the same fuel consumption rate as the SSN-6. My calculations include an atmosphere and a specific impulse that varies with altitude. For both missiles I assume a sea-level specific impulse of 280 sec, which gives a launch thrust of 26.8 t and specific impulse in vacuum of 312 sec. Note: See my subsequent post for revised range estimates.